On this page you will find a map with the most popular dive sites in the state of Texas and a link to a PDF of the medical questionnaire that you may have to fill out before you start diving (if you have any health issues listed in your PADI student folder) and Gigglin’ Marlin Dive & Swim Pool Liability Form. For a list of frequently asked questions about SCUBA diving (and to have an opportunity to submit your own questions) please CLICK HERE. A marine garden of spectacular coral and brilliantly colored sponges, the Flower Garden Banks National Marine Sanctuary beckons divers on a two-day, eight-dive journey through Texas’ backyard Caribbean reefs. 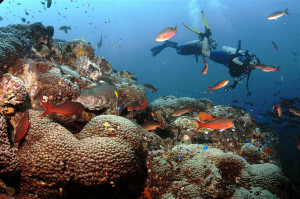 The Flower Garden Banks allow divers to explore more than 400 acres of coral reefs perched atop mountainous salt domes. The reefs host more than 250 species of fish, 375 invertebrates and 125 marine algae. Frequently sighted in this unspoiled wilderness are manta and spotted eagle rays, octopuses, loggerhead sea turtles, hammerhead and silky sharks and, if you are really lucky, a whale shark. For the venturesome, transparent waters mean incredible night dives, allowing divers to see tiny crustaceans and other critters that emerge from the dark to feed under the safety of darkness. 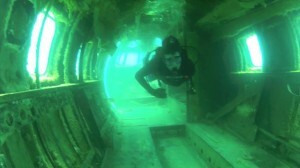 Lodging, meals and air refills are provided on most charters, but divers must bring their own gear. The saline level of the water is high, so additional weights are recommended. 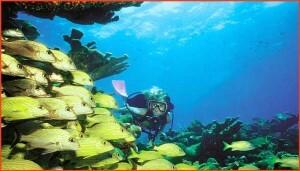 The Flower Garden Banks are recommended for advanced divers only. Fees/Admission: Free to enter the sanctuary; trip fees vary depending on number of days, no user fee charged to boat owners. Helpful Hint: The Gulf seas can be rough, so unless you’re confident your sailor’s legs are up to the test, anti-nausea medications or devices are recommended. Dive Valhalla, a 180-foot-deep abandoned nuclear missile silo near Abilene, offers divers a unique logbook entry and, as owner Mark and Linda Hannifin say, a definite conversation starter… “You dove where?” Flooded with groundwater that filtered through the concrete walls over time, the silo, 60 feet in diameter, once housed intercontinental ballistic missiles aimed at the USSR. Though you won’t encounter any fish or vegetation in the silo, exploring this Cold War icon is an immersion into a fascinating chapter in America’s history. Don’t be surprised if you spot some bones scattered here and there along the floor. Before the abandoned site was transformed into a dive attraction, a few animals fell into the water and drowned. Since light penetrates only the first 40 feet of the crystal-clear water, diving with a flashlight (and back-up flashlight) is mandatory. Dive Valhalla, the only safely diveable missile silo in existence, is recommended for advanced divers. Outfitter: Dive Valhalla is not open to the general public. Trips must be reserved through dive shops. For a list of scheduled dives, call (915) 686-7333. Helpful Hint: The water temperature at Dive Valhalla is always 60 degrees, regardless of outside weather conditions. Full-coverage gear, including boots, gloves and a hood, is highly recommended. A popular adage says that things are always bigger and better in Texas, so it should come as no surprise that we have one of the world’s largest spring-fed swimming pools, a 1.75-acre oasis nestled deep in the heart of West Texas. It’s also probably the best freshwater dive in the state. Plunge into a wonderland of temperate, crystal-clear water teeming with diverse species of vegetation and fish, and springs that bubble forth some 20 million gallons of water every day. The pool, which also accommodates snorkelers and swimmers, offers a controlled environment, exceptional visibility and abundant aquatic life, making it a premier site for open-water certification, night dives and underwater photography. If you’re lucky, you may see a myriad of colorful Mexican tetras, as well as catfish, perch, crayfish, softshell turtles and the endangered Comanche Springs pupfish and Pecos gambusia. Outfitter: Contact Toyahvale Desert Oasis Scuba (next door) at oasis@overland.net or (915) 375-2572 for rental rates and current diving regulations. Helpful Hint: Gear must be carried a fair distance from the parking area to the pool. A dolly, which can be rented at the dive shop, or other easy-tote device, is advised for equipment and tanks. Click here for directions from Houston! While a trip to Belize or the Cayman Islands might not suit your budget this year, an international dive might still be a possibility. Covering some 64,900 acres at normal level, Lake Amistad’s international boundary between the United States and Mexico is marked with a line of buoys down the middle of the lake. One tank, two countries – that certainly renders bragging rights. It offers some of the clearest lake-diving in the state and, thanks to Southwest Texas’ mild winters, the water is relatively warm nine months out of the year. Rocky pinnacles, which drop about 150 feet off the limestone shore at Diablo East, give divers an experience similar to wall-diving, while many underwater caves and rock formations and a variety of fish and vegetation found throughout the lake provide other sites to explore. “I’ve been diving here for seven years and have just barely scratched the surface of seeing what all there is to see,” says Mike McCarson, owner of Amistad Scuba Divers. “It’s such a big lake, you can’t say you’ve dived the lake, just certain spots.” Most of the popular dive locations, including Castle Canyon, Indian Springs and Diablo East, are accessible by boat only. 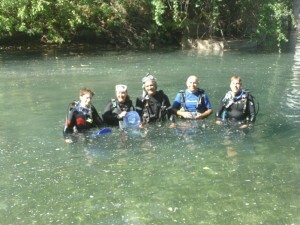 Outfitter: Amistad Scuba Divers, (830) 775-0878, is currently the only dive shop that serves the lake. Full rentals are available, but quantities are limited. Reservations are advised. Helpful Hint: Blooming algae impedes water clarity during the dry, hot months. Diving near one of the lake’s many hydrilla patches can help improve visibility. 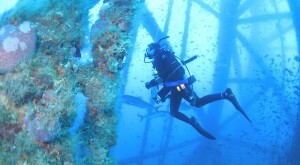 Hundreds of offshore oil rigs that dot the Texas Coast serve as great venues for exploring the most abundant vertical reef communities in the Gulf of Mexico. Come face-to-face with a variety of fascinating marine life, including flounder, amberjack, angelfish, sponges and coral. Divers with more adventurous spirits will look forward to encounters with barracudas and sharks, especially from February to April, when hundreds of hammerheads migrate through the area. Ever tried fishing underwater? The rigs are excellent sites for spearfishing, but shock lines and stainless-steel cable are recommended, since barnacles, which cover almost every inch of the offshore structure, can sever nylon. Varying in depth and visibility, depending on their distance from shore, the oil rigs host many attractive and unusual underwater species that can easily deter your spatial awareness. Always maintain a reference point throughout your dive. Helpful Hint: Coastal and offshore nongame spearfishing requires a fishing license and saltwater stamp. For more information, call Texas Parks and Wildlife at (800) 792-1112. Like a movie set from “Planes, Trains and Automobiles,” Athens Scuba Park furnishes unique backdrops for photographers and an underwater playground that will captivate divers young and old. Whether you’re taking part in a regularly scheduled underwater treasure hunt or navigation race, investigating the engines and cockpit of a sunken airplane, or pulling yourself through the cabin of singer Ray Price’s first tour bus, the park offers a full menu of underwater eye candy. The 33 underwater attractions are all conveniently marked with buoys. Don’t expect to see any aquatic life in this bizarre manmade landscape, however: Fish can’t survive in the low pH of this spring-fed quarry. Complete with nine entry docks, a new outdoor heated spa, swimming pool and camping facilities, Athens Scuba Park is a popular site for skills training and checkout dives. The lake is open on weekends from mid-March to September. Visit www.athensscubapark.com for more information. Helpful Hint: Watch those fins! Kicking up silt from the bottom will quickly hinder visibility. 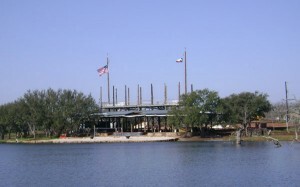 Lake Longhorn is open to the public daily from 9 am to 7 pm. We have 45 acres dedicated to fun and adventure, 15 acres have been reserved for scuba diving, fishing, and swimmers only. We offer 2 dive platforms, 3 sunken boats and a couple of tubes for your underwater experience. All Scuba Instructors must provide proof of insurance before holding classes at Lake Longhorn. We welcome triathletes who are training for open water!! If you are interested in paddle boarding, kayaking, or canoeing that is available outside of our designated swim area. 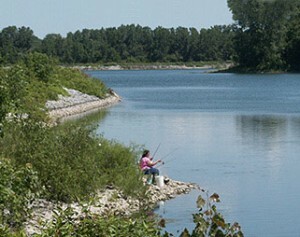 We have large areas of green space with numerous shade trees and picnic tables with great views of the water. If you need a covered area for a party keep us in mind we have a small pavilion with running water and electrical connections which can be rented for a 1/2 day or full day. There are 2 platforms (10 x 10) for training/lessons, sailboat ,cabin cruiser and 2-40″ pipes to simulate cave diving. Some folks will do just about anything to keep their lake clean. An underwater dump truck is one of many sunken objects to explore along the silty bottom of this 20,000-acre lake. Possum Kingdom is a Texas favorite for deep, freshwater diving, with water temperatures ranging 5 to 10 degrees cooler than Lake Travis. From Scuba Point, the lake’s only full-service dive shop, divers may enter the underwater dive park located inside the large, buoyed-off area from one of three pier docks. Scuba Point can also arrange boat dives to sites including The Walls, where cliffs extend 80 to 100 feet into the water, and The Cove. A trip to Possum Kingdom is not complete until you have experienced Hell’s Gate, a deep-water bay surrounded by cliffs and an island. Helpful Hint: Possum Kingdom has a very distinct thermocline, and can be chilly. Full wet suits are recommended. The spring-fed, sparkling blue waters of The Blue Lagoon provide a tropical experience in a not-so-tropical place. Located near Huntsville amid the towering pines of East Texas, The Blue Lagoon’s lack of vegetation and fish are perhaps the only factors missing from a true Caribbean experience – besides piña coladas and reggae bands, that is. The only species to observe is the dragonfly nymph, which looks and acts like shrimp. 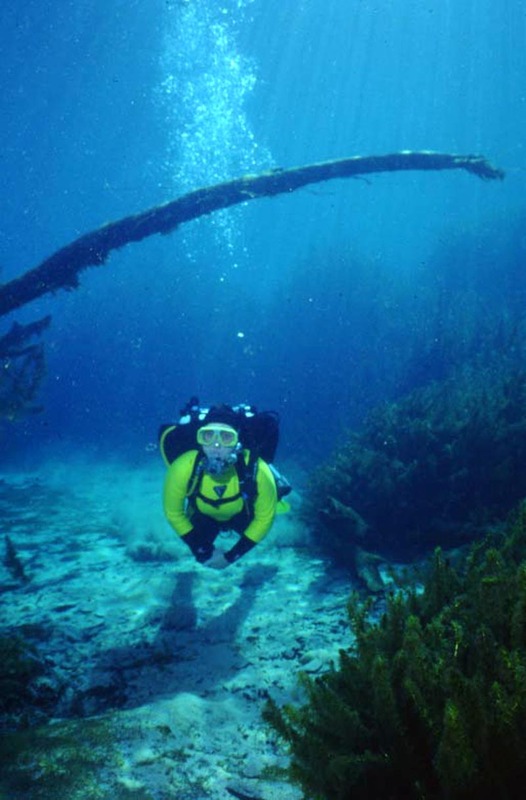 Divers can enjoy night navigation, practice underwater photography and explore sunken boats and an airplane in one of its two limestone quarries. Ten underwater platforms, which help reduce disturbance of the silty bottom, make The Blue Lagoon one of the most popular training facilities in Texas. The Blue Lagoon is open daily April through September, and on weekends during other months. Hours vary, so call ahead. Helpful Hint: The Blue Lagoon is crowded on weekends, so go during the week for better diving and increased visibility. Click here to get directions from Houston! At less than two miles long, the spring-fed Comal holds the title of the world’s shortest river. But with an abundance of fish species, three dive areas (upper, middle and lower), and moneymaking opportunities to boot, the Comal proves that good things do indeed come in small packages. The upper Comal, which lies along Hinman Island at Landa Park, is not diveable on weekends, as tubers frequent this area heavily, decreasing visibility. The middle Comal is accessible from the North Seguin Bridge. Exit at Coll Street Bridge, or continue into the lower Comal, the longest and the deepest part of the river. It provides the best diving, and may take more than an hour to complete. In addition to encounters with catfish, bass, perch and carp, diving the Comal River can be a lucrative experience. The river bottom, consisting of white limestone slabs and silt, is often dotted with money, sunglasses and jewelry from tubers, especially near the shoots. Helpful Hint: When diving the lower Comal, be sure to get out the end of Coll Street (the last public exit), or you’ll free-fall over a small dam farther downstream. 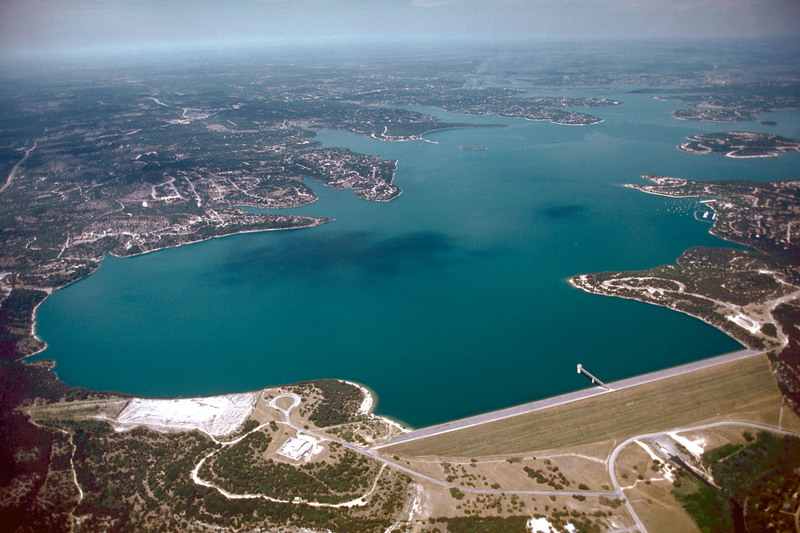 One of the most frequently dived lakes in the state, Lake Travis offers a variety of private and public parks, unique underwater landscapes and marine life including arm-length catfish, bluegill perch, buffalo carp and softshell turtles. Nestled in the rolling hills of Central Texas, many of its parks cater to scuba divers, including Windy Point, which boasts a number of boat and car wrecks in a buoyed-off dive area. The water drops off quickly, and at around 115 feet you’ll encounter a huge pecan grove. When diving outside buoyed areas, be sure to keep an eye out for boat and jet-ski traffic. Other sites, including the cliffs around Marshall Ford Park, which offers some of the deepest, clearest water in the lake, and Starnes Island and Hippie Hollow, are best accessed by boat. Fees/Admission: Windy Point Park, (512) 266-DEEP (3337), $5/person/weekday, $10/person/weekend, free for children 11 and under. Air only. Fees/Admission: Mansfield Dam Park, (512) 854-PARK (7275), 4370 Mansfield Dam Park Rd. Austin, TX 78732, Reservations required for camping two weeks prior. Helpful Hint: A full wet suit is recommended for depths below 60 feet, as water temperature can be as low as 60 degrees, even in the summer. About a 15-minute drive south of downtown Houston, 288 Lake is Houston’s premiere open water sports training facility and outdoor event venue. The pristine, spring fed lake provides the perfect open water experience. Enjoy our serene and unique 20 acre facility where you can Dive, Swim, Kayak and Stand Up Paddle Board (SUP). Lake Whitney is a beautiful lake located on the Brazos River that is popular not only for scuba diving, but also for boating, swimming, fishing, and many other kinds of watersports. 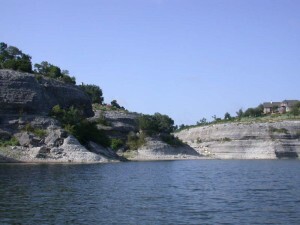 Some of the most popular diving spots on Lake Whitney include Lofer’s Bend Park, Soldier’s Bluff Park, Cliffs on Little Rocky Creek, and King Creek around King Creek Rock Island. Come out to Lake Whitney to enjoy one of the most popular getaway spots in the state of Texas! Location: north of Waco, TX and easily accessible from the Dallas/Fort Worth area. 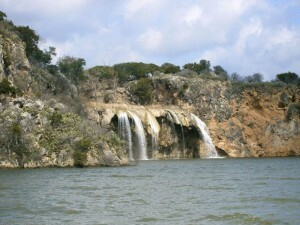 Lake Buchanan is the second largest of the Highland Lakes in Central Texas with a length of 30 miles and a width at the widest point of just under 5 miles and a shoreline of 124 miles. 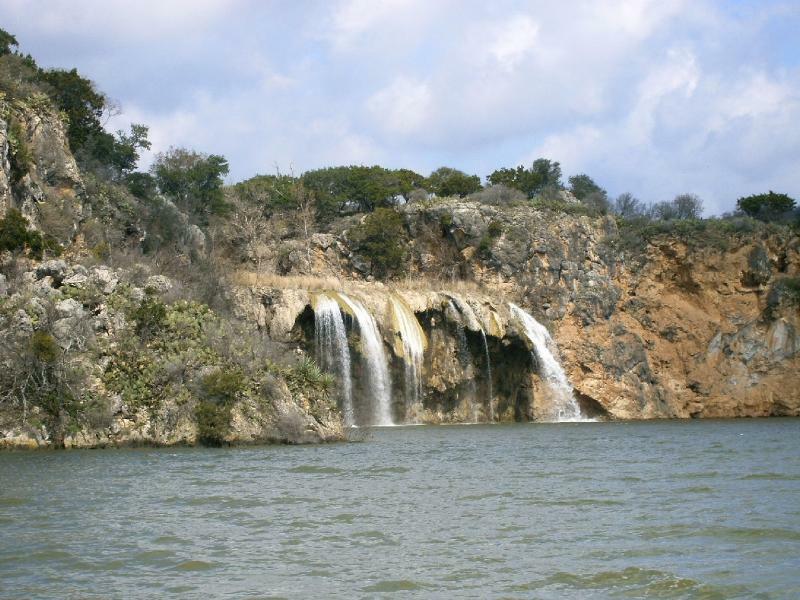 Located on the Colorado River, Lake Buchanan is north of Lake Travis and easily accessible to the Austin, TX area. 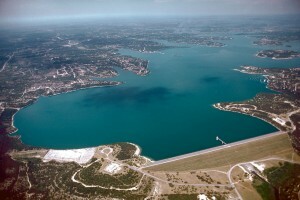 Canyon Lake is located on the Guadalupe River between Austin, TX and San Antonio, TX. Helpful Hint: There are a total of 7 parks surrounding Canyon Lake, and they are all managed by the US Army Corps of Engineers. Guadalupe Park, Overlook Park, and Potter’s Creek Park are open year-round, while North Park, Canyon Park, Canyon Park Beach, and Comal Park are closed from October-March every year. 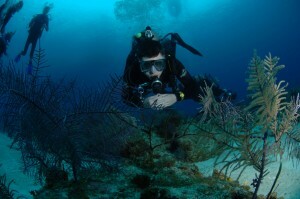 North Park is the preferred park for SCUBA diving activities, and has campsites available. Click here to get directions from Houston, TX to North Park. When not affected by drought, Lake Medina is a popular spot for divers and fishermen alike. Unfortunately, the lake has been severely affected by drought over the last few years, leaving the water level severely low. 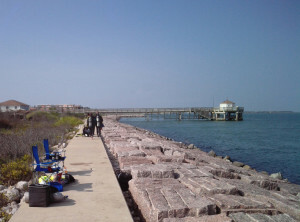 The Port Aransas Jetties are located near Corpus Christi and offer a unique shore dive where you can see lots of marine life. Park Chalk Bluff has a nice dive site for shallow warm dives with large boulders, aquatic plants, some submerged fallen trees and an abundance of fish in the area. Helpful Hint: there are no dive shops nearby, so be sure to bring enough tanks, backup gear, save a dive kits, etc. The lake at Clear Spring Scuba Park has many underwater attractions for divers. There is a dive shop on site if you need to refill your tanks or rent emergency backup gear. Helpful Hint: everyone entering the park must sign a waiver and present their certification card. All minors entering the park must have a notarized waiver signed by a parent unless the parent is present. Come prepared! The waiver can be found here. Reveille Peak Ranch is an outdoor adventure center less than an hour away from Austin, TX. 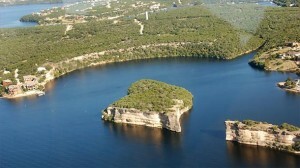 Decades of graphite mining eventually created a half-mile-long quarry lake that is one of the clearest lakes in Texas. 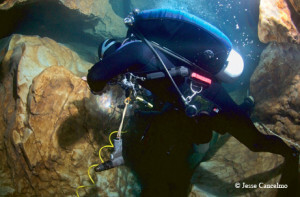 All information about diving the lake can be found on the Reveille Peak Ranch website. Helpful hint: there’s a thermocline at 15 ft, where the temperature drops quickly into the 60s and into the 50s by the time you reach the bottom, so be sure to bring thermal gear! Spring Lake, formerly known as Aquarena Springs, is a restricted access dive site that is home to eight federally listed species and is listed as an archaeological site through the State of Texas Antiquities Law. There is no recreational diving in the lake, but access can be granted to divers who go through the Dive Authorization Course. See over 2000 natural springs bubbling up from the bottom of Spring Lake, learn the history of San Marcos and enjoy the crystal clear water. Then be able to volunteer and dive for free! Detailed information about this program can be found on our website under the courses tab. Gigglin’ Marlin Dive & Swim is an authorized Dive Center for booking students. $230 pp for the Dive Authorization Course. Add $25 and get the PADI Distinctive Specialty! If you answer “yes” to any of the questions on the medical questionnaire you receive prior to the start of your open water class, you must fill this form out an have it signed by your physician before you can start your course.